Hi All, I’m writing to introduce the new tennis club committee, to welcome our new volunteers - Jo Fisher, Jill Craven, Ben Rayment, Toby Helm, and Julian Jones - and to circulate the reports from the annual meeting and survey. I’m excited to be stepping up as tennis chair at such a great time for our club, with a record more than 300 adult members and 70 juniors, and two new floodlit hard courts finally in the pipeline, our club is going from strength to strength. But sad also that the committee is losing Susie Giles who has done so much for the club, as committee member, social organiser, sports club rep and finally as tennis chair, most recently for the beautiful memorial event she organised for Grace. We’re hoping to entice Susie back to help – not least for the tennis Christmas party which she herself is organising in just a couple of weeks time on Friday 8th December, tickets selling fast here! Thanks also to David Penston who also steps down from the committee after many years of service, especially for his work as treasurer and council rep during the last attempt to build new courts - our project now is all built on the foundations he laid then and the sage advice on past history he's been able to give the team. What can you expect from your new committee? The top priority will be the new courts, but there’s plenty more to be done, we’ve collected loads of great ideas from the members survey and the AGM, and we’ll be looking to meet and get views in person from as many of you as we can over the next weeks. So please don’t be surprised if a strange guy in a blue tennis cap and a cat on his head wanders onto court to say hi. As you know, Grace Chorley our Honorary Chair and before that long-standing active Chair sadly passed away this summer. 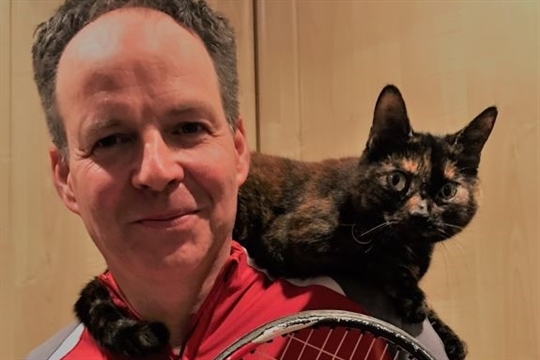 No committee can replace what Grace did often almost single-handedly for so many years, but we will do our best to keep alive the spirit of excellent tennis and friendly sociability that makes our club what it is today. See you on the courts soon.